1. 上門安裝前客戶須提供相關資料，如：使用 device 數量、單位大小及 port 位等，以便 Original 評估 Velop 所需的數量。 2. 服務詳情有可能受現場實際環境及顧問給予之意見而改變，以最終安裝後確認。 3. Wi-Fi 覆蓋視乎單位間隔、建築材料及其他外在因素、客戶的要求範圍及顧問給予之意見而定。 4. 測試及安裝成功須現場以信用咭 (只適用於Visa或Master) 付款。 5. Original 同事穿著制服入門安裝。 6. 不包括鑽牆，加 port 位及其他服務。 7. 安裝前須先準備由電訊供應商提供之互聯網帳號及密碼，以便同事安裝。 8. 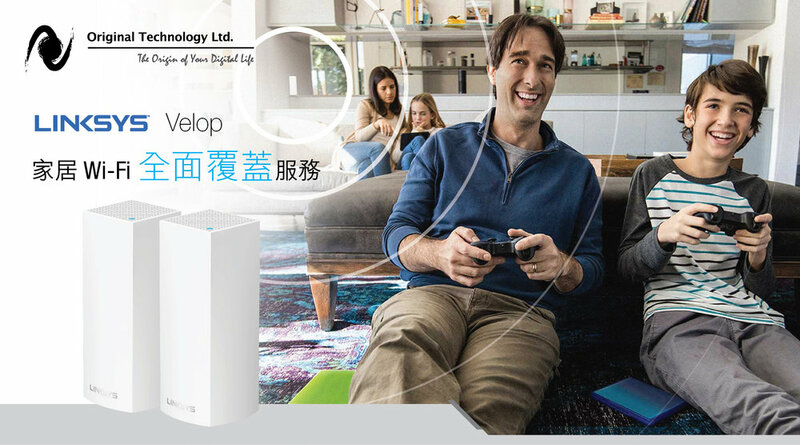 Linksys Velop 所使用的插頭為 “I 制式”，若客戶所用其他制式插頭，須自備轉插器。 9. “一條龍安裝服務” 只適用於澳門特別行政區境內的地方。 10. 在安裝途中，客戶應小心保管個人財物，若發生失竊事件，本公司將不承認任何責任。 11. 如有任何爭議， Original 擁有最終決定權。 1. Customer is required to provide related information e.g. quantity of devices, size of house, quantity of ports etc. 2. Service details and installation plan may be changed in accordance with environmental factors and the advice from Original Team when visiting your home. 3. Wi-Fi coverage depends on factors such as size of house, layout of the premises, nature of construction materials, other extraneous factors, as well as area of coverage specified by customer and advice from Original Team. 4. All payment must be paid by credit card (only applicable to Visa and Master) once the installation and testing is completed successfully. 5. Original Team will wear uniform with company logo. 6. The above service is excluded drilling, additional ports and other services. 7. Wi-Fi account and password is required to provide for installation. 8. The plug of Linksys Velop is “I mode”. Own adapter is needed if other types of plugs are using. 9. The above service is only applicable to the district of Macau SAR. 10. Customer has to take care of own belongings and precious things at home. Original will not bear for any loss and damage during the installation. 11. Original reserves the right to amend these Terms & Conditions and to terminate this service without prior notice. 12. Should any dispute arise, the decision of Original shall be final. Thank you for your registration, we will contact you shortly!